For any of you that read my blog (and I know that thousands of you hang on every word of it), you know that I’ve urged owners to be proactive in the way they manage their businesses to create the most value. 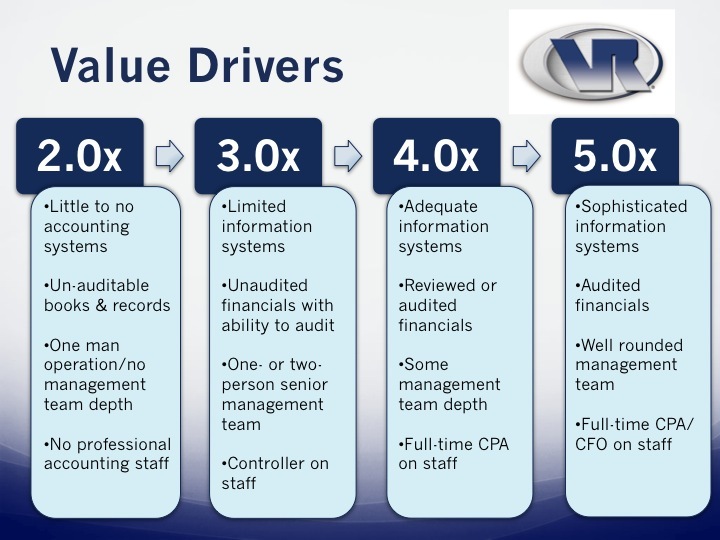 One of the best ways to explain this is by a chart that was presented by a Private Equity Group made at a conference I attended that addresses the operating aspects of a business that most effect valuation. All owners ought to examine it. The difference in valuation between one that has poor management systems and one that has excellent management systems can be as much as 2 to 5 times EBITDA. If you’re not at the right side of the scale, then invest in the time and allocate some resources to get yourself there. A good CPA that understands tax affects on a sale. Your current accountant may be the right person, but you should speak about this with them and make sure they’re well versed on the tax issues of selling a business. If they aren’t, then ask them who they would recommend. A good business transaction attorney, who, more often than not, is not your personal lawyer. You need an attorney that has done a lot of transactions. If the business you’re selling has any significant value, then the price you pay them (which is going to be more than your neighborhood lawyer) will be well worth it. This is usually the biggest transaction in an owner’s life and being cheap can wind up getting you some bad legal advice. It will always come back to haunt you. A good financial planner that specializes in handling liquidity events, which are often the sale of a business. It may be the financial planner you currently use or if not, that person may have someone else in his or her firm that does. They should be brought into the process well in advance of sale because they can advise on issues such as trust and estate planning that can’t be dealt with a week before the closing. Ideally, an owner should begin to discuss these topics with them two to three years before the sale. Frankly, in our experience, there is no transaction too small where advice from all these people wouldn’t benefit the seller. No matter the size, the issues are frequently the same. So, if you don’t have all the members of the team, ask us and we can make some recommendations.